Just wanted to let you know that the new designs are NOW available for sale on our website here in the New Products section at the bottom of our homepage....AND the book is available for pre-order too! We are offering it at a special promotional price of $25.99 until it is in house next month. When you place your order, it will not be processed until we receive our stock. We will notify you when it ships. Please also remember that you can request to have your autographed copy personalized. Just leave your instructions in the comments section when you place your order. I got my promotional copies on Monday afternoon....the book is just beautiful! My publisher did such a wonderful job with the layout and photographs...I know you are going to LOVE it! Go on over and take a peek....there are some more shots of the projects as well as some points of interest about the book, too. 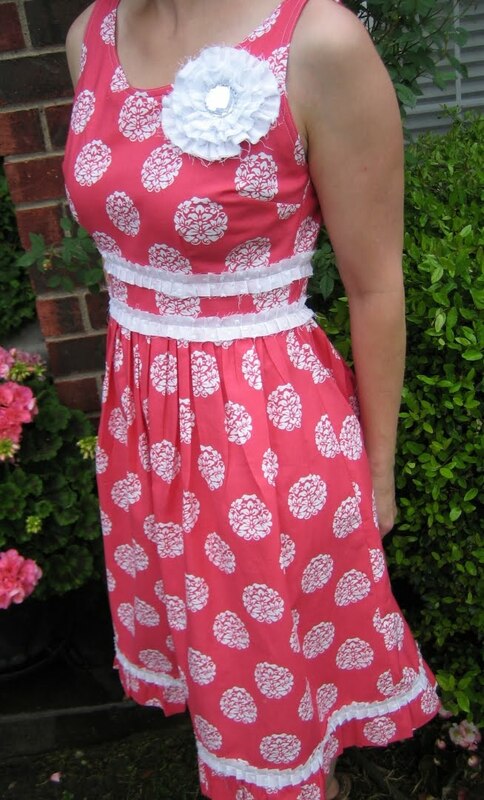 Below is another project from Sew Serendipity. This is the Ruffled Skirt. Time is drawing close for market now. We will be leaving in a week and there isn't a ton left to do, but I still have a few things I want to sew before we fly out. If anyone is attending the show in Minneapolis, please come by and say hello! We would love to visit with you and show off all the new goodies. We will be in booth #1835. I am also going to do a presentation at Schoolhouse the day before market opens, showing the projects from the book and discussing the layout. If you will be in attendance, be sure to check it out!